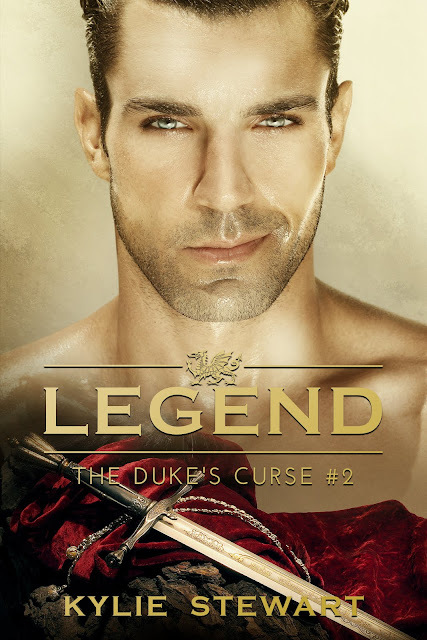 Legend: The Duke's Curse #2 Alexandria knows the truth behind the lies. Avalon is not human, nor is he immortal. He is neither angel nor demon. He is the once and future king. Now, more than ever, Alexandria’s artistic skills could grant them their first victory in battle. It is she who holds the key to end a curse born over a thousand years ago. Will she walk away from Avalon or stay? The choice is up to her, but more than one fate hangs in the balance now. Avalon’s deepest fears lurk in every shadow. His past haunts him even in the light of day. Unable to protect Alexandria, he turns to Lancer for help. Debilitated under his newly arisen weakness, his only hope lies in Alexandria. Bound by chains of sin and shame, Avalon must fight to the death with who he once was to inherit his future. If he loses, it is Alexandria who pays the price. Can he trust her to save him from eternal darkness? Or will he lose her forever? With a soft laugh, she shook her head. “Then wait until tomorrow. I don’t want to hate you right now.” He fingers pulled the bow loose. I did my best to keep eye contact, so she didn’t think she was having any effect on me. How was I able to control myself so easily? Pain ripped through the tips of my fingers, and I realized I was holding onto the wooden post for dear life. Ah, so that was how. When did I become a modest man? Alexandria nodded, shrugging her shoulders; the robe fell to the floor. She stood before me in an emerald nightgown that went to the floor. A slit ran up her right thigh, exposing pale skin. I blinked. My voice didn’t want to work. My throat grew tighter, and my lungs couldn’t control the intake of air. She was straight from a dream. She was perfect, and she wanted me. “Avalon, say something. If you don’t want to, I’ll understand.” I saw the embarrassment cross her face. I rushed to her, but I kept an inch between us. I wouldn’t strike until she told me to. I allowed my eyes to travel up and down her small frame. I circled her like a wolf stalking his prey. I could see every curve of her body, every ripple of lean muscle through her nightgown. A soft moan passed between us as I rested my hand gently on her stomach. I moved behind her, and I pulled her back to me. Our bodies molded perfectly. With my other hand, I took a fistful of her hair and tilted her neck back against my chest. We were past the point of no return. She needed to know that. My breathing was coming fast and harsh. I nipped and licked along her neck, stopping at her ear. Just say the words, woman. Come on, I’m going to rip my trousers. Nothing but the sound of her gasping for breath answered me. “My love ...” I spun her to face me. I captured her cheeks and drew her into a deep kiss. Alexandria hesitated at first, her lips unwilling to move with mine. I waited, nibbling at her lower lip, begging for entry. Finally, she kissed me back. It was soft, tender, and then her mouth opened in a moan as my hands gripped her bottom. I slid inside and met her tongue. A part of me expected her to bite me, but she didn’t. Instead, her arms wrapped around my neck, and it was as if I was being pulled into her. She drew soft groans from me as her tongue warred with mine. I got lost in her. So lost, I felt as if I could survive on her taste alone. We barely came up for air as I backed her toward the wall. When she could go no farther, I picked her up and braced her. She remembered. Her slender legs wrapped around my waist as we continued to spar. My left hand grew bold and shoved the silky material up her thigh, feeling soft skin below. When I pulled back to look at my prize, the burning in my core became almost unbearable. She was gazing at me as though she wanted to devour me. I would let her. Kylie Stewart has been writing short stories and books all her life. A native of Hammond, New York, Kylie grew up on the St. Lawrence River dreaming of big things. She has a Master’s of Science in Equine Business from Middle Tennessee State University, which is why there are so many horses in her books. After working in the Kentucky Race Horse Industry, she moved back to Tennessee to pursue writing, audio book narrating, and voice acting. She is a huge nerd and big into anime as well as the cosplay community. Kylie was influenced by her Scottish heritage to become an independent British history buff. 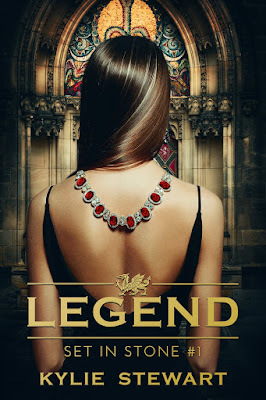 She has a small library dedicated to Tudor history and is lover of the Arthurian legends. She also has an intense love of the supernatural, theological, paranormal, and mythological worlds. 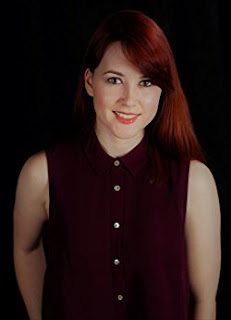 Kylie lives in Dallas, TX with her husband and fellow voice actor Eric Rolon, and their two cats, Asuka and Haru.